Movie posters can be simple, descriptive representations of the contents of the movie, or other times they can be works of art. I used to have several of the movie posters below on my bedroom wall and I used to also collect those postcard sized movie posters that you’d get in shops like Forbidden Planet. I couldn’t get enough of them. Below are the ones that I have most nostalgia for in terms of how they thrilled me and sparked my imagination back in the day. There are a few others that are probably more respected, which I have put in the Honourable Mentions list, but the Top Ten are my own personal favourites. It’s hard to get more iconic than the Rocky Horror lips. It was an image that really got burned on my brain in my early teens when first saw it. I’m a digital creative now, who uses Photoshop every day, and I actually remember that my second ever piece of digital art (using Microsoft Paint) was of the Rocky Horror lips. I’m sure you’re dying to ask what the first one was. It was of a comet in space. Well, you did ask. The 80s had a thing with having big muscular men looking cool on movie posters. It certainly was a popular tactic with teenage boys who wanted to be the next action hero. This Commando poster is just a simple photo of Arnie looking cool. Awesome. Drew Struzan really is the king of movie poster artists. I’ve got two big art books of his work. This Goonies one is one of his most iconic. I just love the clever way of getting all the characters on there but also giving it a fantastic sense of depth and perspective. Another simple one of a muscular guy looking cool. But this one somehow seems more arty. The angle of the camera, the stark red and black colours, the airbrushed shading of his sunglasses. So cool. I also had this image engrained on my brain because it was the cover art of the video game which was one of my favourite 8-bit ZX Spectrum computer games. All the Star Wars, Empire and Jedi posters are good, and there are several Star Wars Episode IV posters, but it’s the one above that I always think of. I just think it’s a brilliant example of a cool, action poster where Luke is pointing a blaster right at the camera and everyone else has light sabres and blasters all pointing in different directions. Great composition, great colours. It just seems to capture the adventure and the excitement of the movie perfectly. The Ghostbusters logo is just pure genius. So recognisable and it was used so well in the marketing before and after the movie, as well as in the actual movie itself. Pure genius. And the image of the three main Ghostbusters was another image that was engrained on my brain because it was also used on the cover of the movie storybook which I poured over endlessly. Classic Drew Struzan again. I just love his style. He paints things in such a photorealistic way but also somehow is able to add a fantastical layer, like a magic sheen on top that gives things a sort of ethereal glow. The composition is great and the pose of Kurt Russell just perfectly captures Jack Burton’s personality. This is kind of in the same realm as Commando and Cobra but there’s slightly more happening in terms of design. It basically just says ‘big scary robot with gun’. I’ve got a very cool Asian version of this up on my mancave wall just now. I really don’t know what it is I like about this poster but I just love it. Always have done. There’s something about his stance which says he’s just about to pounce into action. And because the camera is further away you feel almost like he’s suddenly turned round to look right at you, which is pretty scary to think about RoboCop turning round to stare at you. But there’s also something going on with the colours which is really cool. He’s slightly more orangey red or something than normal. Maybe it’s the reflection from the cop car light. It just works. I never knew if it was just a photograph or if it was actually a painting but then I saw a couple of years ago that the original painting that was used for this poster was up for auction. I can’t remember how much it went for but I’m sure it was a lot. I remember cursing the fact that I wasn’t rich and couldn’t buy it myself. If I ever become rich I will be hunting it down. Dead or alive, it’s coming with me! There was never ever doubt what was going to be my no.1 movie poster. This Back to the Future poster was on my wall for the best part of 8 years. Pride of place. I can distinctly remember seeing it in a shop when I was out with my friend and his mum. I saw it, fell in love with it and just had to buy it. I managed to convince my friend’s mum to buy it for me and that my mum would give her the money for it when we got home. I’m so glad I managed to get it. It is just a classic movie poster. It’s got the DeLorean, it’s got Michael J Fox, it’s got cool shades of blue and orange colour. It’s just awesome. And of course it spawned a clever series of sequel posters (with Doc Brown standing uncomfortably close to Marty in them). And guess who painted this one. Yep, the legend that is Drew Struzan. This is a pretty raw, basic photo of The Blues Brothers but I just loved the cool, stylish approach. It doesn’t complicate things by trying to be clever. It just shows Jake and Elwood looking cool and moody. And I love the black and white feel and the whole balance of the piece. Check out our other Top Ten blog posts or alternatively view the Top Ten archive page. Cheers Hayden. 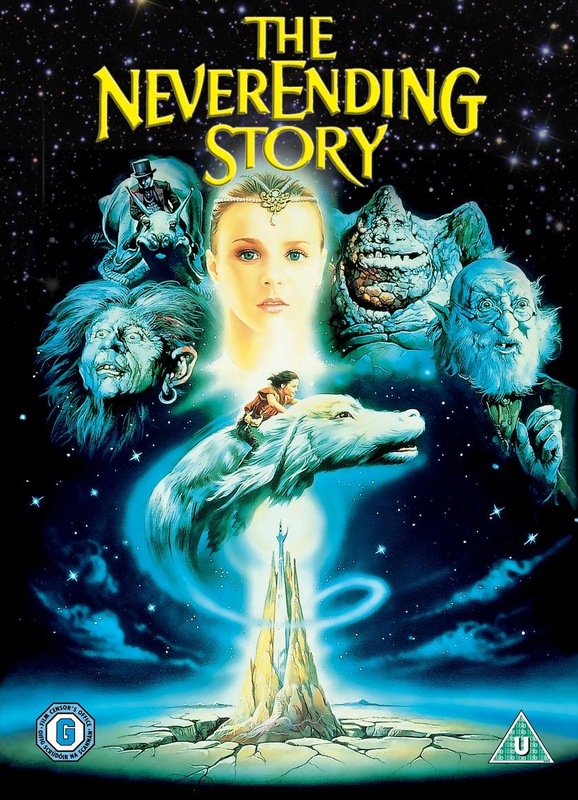 And yes good shout with The Neverending Story!